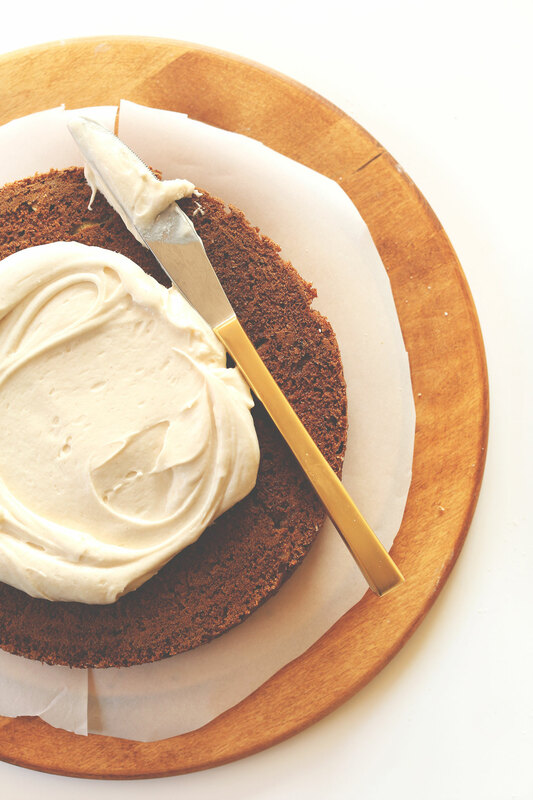 3-ingredient Vegan Cream Cheese Frosting, perfect for cakes, cupcakes, quick breads, cookies and more! Add sifted powdered sugar in 1 cup (100 g // amount as original recipe is written // adjust if altering batch size) increments until thick and spreadable and to desired sweetness. Perfect for frosting cakes, cupcakes, muffins, and more! Refrigerate after frosting to keep fresh (up to 5 days). *Recipe makes ~2 cups frosting. This is my go to cream cheese frosting made as directedvwith Eart Balance Stick, Trader Joes Cream cheese and 2 1/2 cups – 3 cups of organic powdered sugar…the taste is amazing and the frosting firms up on the cake sitting in the fridge after a little awhile. This and your carrot cake are our family’s favorite cake!!! Thank you so much for sharing all your recipes….I just heard a rumor though that you are no longer doing vegan recipes…you are huge in the vegan community and am broken hearted by this if this is true!!! I’m looking to make a birthday cake for myself and my two sisters (all of our birthdays are within two weeks of each other, March is a hectic month for us) next week based on Hagrid’s cake from the Harry Potter books (a chocolate cake with light pink frosting and dark green iced lettering). I went vegan in the beginning of the year and have found a chocolate cake recipe I like, but I have yet to venture into trying frosting. From what I’ve read online so far, my best bet for vegan food dye in pink would be to juice beets, cook them down into a paste, and add it little by little until I get the desired color. Do you think that technique would work for this recipe? We think that should work! We haven’t done so with this frosting, but have used our DIY Natural Food Dye in buttercream frosting successfully. If you give it a try, let us know how it goes! I made this to go with the pumpkin cake. I substituted the following: earth balance soy free buttery spread in the tub and daiya spreadable cream cheese. I was skeptical this would work, and pleasantly surprised that it did. The daiya smelt of coconut somewhat but didn’t taste of it. I used 3 cups of powered sugar and it was spreadable. Good flavor, had the mouth feel like cream cheese frosting, and tasted like it also. This was so good we ate the left-overs with a spoon! I wish I read all the comments before I put this frosting on a birthday carrot cake. We used vegan Miyoko’s butter & vegan Kite Hill cream cheese (plain) with extra sugar and taste great but much too soft and the cake slid apart. The frosting seemed firm enough when I started frosting. I think the frosting needed to be chilled before putting the cake together. Its in the fridge now and I will hopefully be able to piece something back together in a few hours. As a followup. The frosting oozed out of the cake and hardened on the sides in the refrigeration. It tasted great. Will make again. Next time with more sugar and chill the frosting. I made half of this recipe to go on your gluten free cinnamon rolls that are baking in the oven as I write. I used 2 oz. coconut butter and 2 oz. Miyoko’s cultured vegan butter (I didn’t have enough of the butter) and 4oz. Kite Hill vegan cream cheese, 1 1/2 cups powdered sugar, a pinch of pink salt and a splash of vanilla. It is so good I could eat it out of the bowl, but am trying to control myself from having another spoonful. Made this today for my vegan + GF carrot cake using Go Veggie brand vegan cream cheese, 3 cups powdered sugar, the zest of one lemon, and a bit of vanilla extract. I sifted the powdered sugar and it was a bit “clumpy,” but not enough to matter. Tough not to eat the whole bowl. Thanks! Mine is clumpier than I would prefer. Did you figure out how to get them out? I combined the butter and cream cheese (both at room temperature) with a paddle blade on my stand mixer. I then added 1 cup at a time of the powdered sugar. After the 2nd added cup, I did a little taste and it was starting to get pretty sweet. I added the 3rd cup of powdered sugar, and it was TOO sweet, so I stopped there. It looked pretty thick so I put it in the fridge until the cake layers cooled down. When I took it out of the fridge, it had become a bit more liquidy than before, and didn’t look very good when I put it on the cake. Also, the layers didn’t stick well together. What could I have done at this point? Adding a 4th cup of sugar would have been sweeter that I wanted it to be. Any suggestions for next time? love it, one of my favorite cake frosting. I dot always use butter. I make it cream cheeses and powder sugar only. I made this cake at the request of a local restaurant that I do business with. It turned out beautiful and tasted fabulous. Their customers wanted vegan , but they just list it on their nightly menu as carrot cake and people can’t distinguish it from regular carrot cake. I tried to use your gluten-free flour mix but found the cake much drier than the mix I bought (Domata). I want to try your chocolate vegan cake. I see that it is not gluten-free, however. Could I use gluten-free flour in place of the all-purpose? Made the cake and it was delicious! Didn’t have a way to weigh the flour so I started with 1 1/2 cups and it was perfect. Also added pineapple and raisins per my dad’s request and was happy that they didn’t mess with the consistency. For the icing, I just found a basic cream cheese icing recipe and subbed in vegan cream cheese. Everyone said they had no idea the cake or icing was vegan. Glad to hear you enjoyed this recipe, Alyssa! Why is the title 4 ingredient when I only see three listed? Hello! I have a couple of questions – hoping you can help me!! 1) Is it possible to pipe this frosting on to cupcakes? Will it hold its shape? 2) I want to make carrot cake cupcakes for my upcoming wedding reception, which is an outdoor picnic, so I need a frosting that will stand up to the heat for an hour or so. Do you think this frosting will be okay? Hi! 1. I think it’s too soft! 2. I would recommend keeping them in a cool place if possible! Could i replace cream cheese for something else as i don’t eat cream cheese? Would cheddar cheese taste weird in it? I wouldn’t recommend using chedder cheese for this one, Alisa! You could try using cashew cream! Pretty disappointed in this frosting recipe. I normally make a vegan frosting with Earth Balance, powdered sugar, a splash of non-dairy milk, and vanilla or another flavoring, so I was immediately skeptical that adding more powdered sugar would make this come together after adding a whole tub of vegan cream cheese. I decided to make it anyway, but it was really soft, even after adding five cups of powdered sugar. I also couldn’t taste any cream cheese flavor (I used tofutti cream cheese). I added some lemon and vanilla to salvage it, as I am baking a cake for tonight and don’t have time to go get more ingredients to make another frosting. Would not recommend. I made this using Daiya cream cheese, vegan butter and only 2 1/2 cups of confectioner’s sugar as I don’t like extremely sweet frosting. It still was a tad sweet and started losing the tartness so I added about 2 TBS of lemon juice, dash of vanilla, and about 3 TBS of all-purpose flour to thicken it up again a little (not thick enough for piping though). Tastes delicious and I can’t wait to put it on the vegan carrot cake from your recipe. I will try a different vegan cream cheese next time if comments mention one that is tangier, hopefully the lemon won’t be needed then. For anyone looking to use coconut oil, please be aware that 100 studies were just consolidated and published about the unhealthiness of coconut oil – it has more saturated fat than almost all other fats and should be avoided if you’re eating vegan for your health. So sorry to be the bearer of bad news for everyone who jumped onto that train, but it’s true. This recipe is simple and tastes absolutely delicious. I’ve recently had to cut out dairy completely and I made a carrot cake and needed a cream cheese dressing. I was worried it wasn’t going to actually taste “cream cheesy” but it does and it’s so good! I followed these instructions exactly, including leaving the cream cheese out of the fridge for an hour prior to mixing, but unfortunately I never got the smal chunks out of the frosting even after mixing with an electric hand mixer for over 30minutes. The frosting did taste wonderful though!! Did not taste fake to me at all. The vegan carrot cake this frosting is for came out very good. This was advertised as a “4 ingredient frosting but only 3 (vegan butter, cream cheese, and powdered sugar”. Did you forget vanilla? Hi Carl! You can totally add vanilla! Dana, I just want to say: your website and recipes have been a HUGE help on my vegan pathway. You are just so generous to provide all of these great recipes, in a really pleasing format that is easy to use as well as just beautiful. Thank you so much!! Maybe try the powdered stevia blend if you don’t mind the taste of stevia. Is there a low sugar option for the frosting that doesn’t call for powdered sugar? Omg! I just made this cake! It’s seriously the best carrot cake I’ve ever had!! I did the cream cheese frosting. One thing I did add was toasted unsweetened coconut flakes. Delish! This has become our family’s go to frosting recipe for cakes & cupcakes for the past year. I sometimes add a drop of orange or lemon flavoring to the mix & always get asked for the recipe. Thank you for your delicious recipes! I send others to your site. The worst part about vegan desserts is that making them both tasty and low fat is almost impossible. For example, there is a light non–vegan cream cheese. Not available with the vegan cream cheese. This is so frustrating that I’m considering making non vegan desserts, just so I can make them might again. If you have any suggestions for low fat desserts that still taste good, especially for this recipe, I’d greatly appreciate them! Can you freeze this after putting thr frosting on? Hi! If you are referring to the apple gingerbread cake, you can freeze it! As for the frosting it is best kept in the fridge up to 5 days! So glad I found this in a search, and why didn’t I think to come here first, because I love your recipes. You saved the day, er, um, the weekend as I’m making vegan cupcakes for an Ecstatic Dance Day Retreat potluck. Thanks so much and I was going to make the Vegan Cupcakes Take Over the World Chocolate Cupcakes, but I may check your link, above, first. P. S. Are all these recipes in your cookbook, as I’m a new follower since 2016 and I notice this post is from 2014. Whenever I make this recipe I always add a little splash of vanilla for a little bit of extra flavor. That tiny addition makes a world of difference! I was wondering about how many cupcakes this recipe would frost, can someone let me know? Hi Elie! One dozen for sure, maybe a couple more! I was introduced to this awesome hacker who helped me hack into my boyfriend Facebook account, she is the best and trustworthy, I had problems and she helped me solve everything in less 12hr…. she goes by the name Ella Mane. She hacks into any social media account e.g instagram, kik, gmail, Yahoo mail, hot mail, hangout, what’s app, websites, imo, viber, massager, LinkedIn and many more….she is legit and good. If you ever need a hack job done…please do contact her via email: karenwayer6050gmail.com or kik: felchapo. I promise you that you will never regret hiring her. Thank me later! The most amazing cream cheese frosting if you are a sweet tooth. So thick and creamy perfect for a carrot cake frosting. The tofutti cream cheeese is amazing if you’re vegan or not. I made this for a friend who needed dairy- and gluten-free red velvet cupcakes with cream cheese frosting for a birthday. The frosting as written really didn’t taste much like cream cheese (more the fault of the vegan cream cheese itself than any shortcoming of the recipe). To remedy that, I added about a teaspoon of lemon juice and a bit (1/2-1 tsp?) of vanilla extract. It had that perfectly slight sour twang. I also found that simply using the 3 cups of sugar without the flour was just about perfect. To thicken I think I will use unsweetend cocoa powder and sub some of the vega margarine with vegetable shortening. Hopefully that works and can keep it stable at room temp. My son has allergies to nuts, eggs, dairy and gluten. 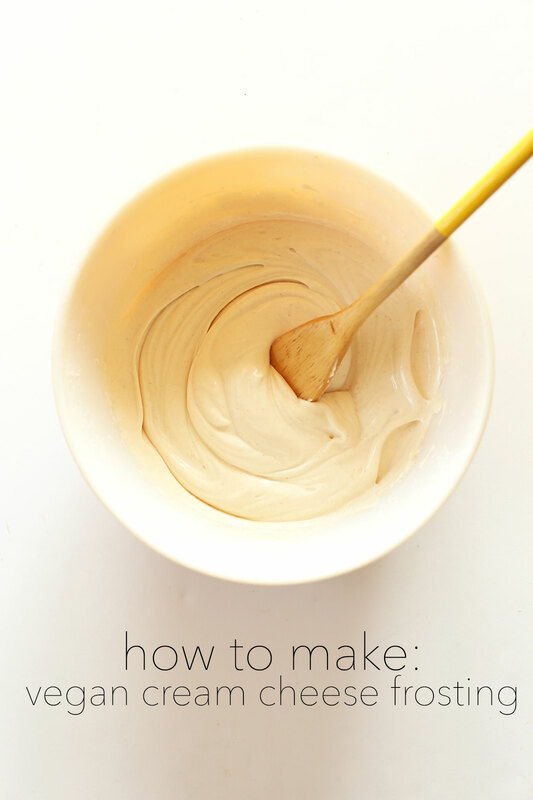 Best vegan icing recipe EVER! I switched the vegan butter with coconut oil (thanks to reading previous comments) and added a few more tablespoons of cream cheese and I loved it! I used it for some vegan banana cupcakes and my kids went crazy over them. Thanks for this. I’m totally keeping this recipe for future use. This was relish! I used Kite Hill’s “cream cheese” and 3 cups of powdered sugar. I actually didn’t need the flour as it was too thick, so threw in a splash of almond milk. I kept it in the fridge until serving because it started drooping a bit at room temp. For those of us who don’t have access to vegan cream cheese and vegan butter, do you have any recommendations on what we can substitute those with? This looks amazing! Would it be suitable on cinnamon rolls? Made the frosting and all I tasted was soy and sugar-and I only added two vupd of sugar (didn’t need more) so I added vanilla and a little cinnamon and it added depth of flavor that made a delicious frosting appropriate to the recipe as well. Soy cream cheese doesn’t taste close to real cream cheese but the texture of it makes for a nice frosting. do you think ill be able to pipe this frosting? I think it’s too soft! I was able to pipe this. I just had to refrigerate it before hand and keep the cupcakes refrigerated until shortly before serving. They’re beautiful! Note: I used Earth Balance butter and Better Than Cream Cheese brands. I also only used 3 C of sugar and no flour, plus about a teaspoon each of lemon juice and vanilla extract. the recipe bills it as having 4 ingredients but I only see 3….since I’m a rookie baker, can you tell me what I’m missing??? Can I use brown rice flour for the flour called for? What flour do you recommend for best taste? Thank you!! What a great idea to use flour to thicken! All sugar ends up way too sweet. Thanks! My boyfriend made me the carrot cake with this frosting for my birthday since it was my favorite kind of cake before going vegan. Thank you for having the recipes for him! It was an amazing birthday. I’ll look for the Kite Hill brand! My son has many food allergies, we use Kite Hill products and we all love it, the taste is great in all their products and the closest to dairy I found so far, believe me, I tried almost everything. I’m planning to use their cream cheese for this recipe :) can’t wait for him to have frosting! So happy I found your website, thanks so much for such a great recipes. WOW!! Thank you so much for the Kate Hill info. Follow My Heart is even better unless you are soy sensitive. Kite hill is good though just not as thick. It can be found at Whole Foods. Could I use potato starch or coconut flour for the flour? I’m gluten sensitive but don’t want the frosting to be super sugary. can I use a Gluten Free Bread mix to make Cinnamon Rolls? Not sure! But if you give it a try, let me know! I’m a pastry chef and I gotta agree with this, it just sounds awful. Add more sugar or make an old fashioned style buttercream where you make a sort of thick custard to cook out the flour then beat it with butter. Hi there! I love love your work! And especially your how-to’s. It’s satisfying to learn how to make some of the “staples” we can take for granted. I wondered if you’ve come across any vegan cream cheese recipes? I’m interested to learn if it can be done and taste better than store-bought options? Thanks for all you do! I just make a straight buttercream frosting. I sub the butter with earth balance buttery sticks and use soy or almond milk. It is always delicious. Make sure the buttery sticks are cold when you make it. Incredible! Used it on a boxed allergy free/vegan carrot cake. First time my nephew was able to eat either and the whole family was very impressed. “I can eat this?! !” Perfect! tasted okay but i might try using 3/4 cup cream cheese 1/4 cup butter because it was a little too buttery. And remember to use unsalted butter! This turned out great. Smooth and creamy and delicious. I adding a few dashes of vanilla extract and the flavor was perfect. Can I use nuttelex sunflower/canola butter? Can I use gluten free flour? Needed to double recipe but ABSOLUTELY delicious! I am wondering how long this frosting is able to sit out on frosted cupcakes? May I frost them in the morning for an event and have them out all day?? Also, may i make the night before and refrigerate? Great recipe. Wondering if I can substitute flour with coconut flour or something of that kind. Any suggestions? I taught my partner how to make carrot cake and now he makes one every week for his lunches (I’m not even joking… EVERY WEEK). I’m also not vegan but do like to try a vegetarian or vegan recipe once a week or so just to break things up a bit. Aaand I usually don’t eat the cake because I can’t justify it every day (who could?!) But I may have to show him this and allow myself a slice or two from now on haha thank-you!! First I must say I’m a huge fan and can not wait for your cookbook it can’t come quick enough for me. This frosting knocked the socks off my family and myself I followed the recipe exactly and it was thick just the right amount of sweetness and very creamy thank you! Did you add flour inbordrr to thicken the texture? Or did you add more sugar instead? Definitely use more powdered sugar to thicken if it’s not thick enough! Hi, how many cups of the sugar did you end up using? Hi I’m wondering if I can use coconut oil instead of vegan butter? What can I use instead o the vegan butter? Maybe try softened coconut oil? Or double up on the cream cheese? Thank you. I try not to use processed oil . I second the recommendation for coconut oil. 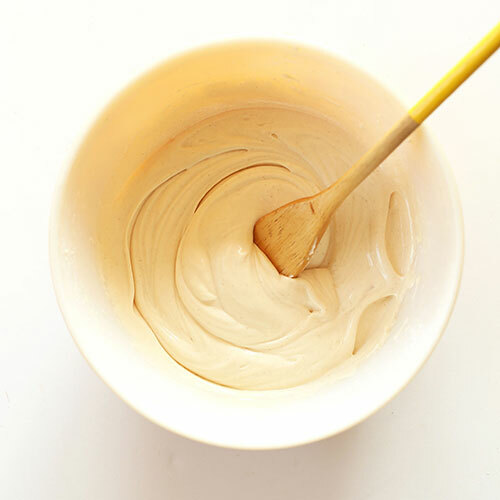 The only trick is that your frosting will be more temperature-sensitive (coconut oil melts at a lower temperature than butters do), so you may want to refrigerate your frosting before using it to help it firm up and again until serving to keep it from melting off. Yes, keep in mind, coconut oil starts to melt at 72 degrees. This makes it tricky to use in icing. I tried double cream cheese and it was delicious. If was a little runny but I think if you refrigerate it 30 minutes before spreading it will work out better. I like to sub coconut oil for butter and though I have not tried it yet with this recipe I have subbed it in many others and always turns out great! You could use “spectra” vegetable shortening. It’s 100% vegetable based, non-gmo and organic. And full of palm oil! I am putting together my Christmas Eve and Day menu’s and will definitely be incorporating this frosting onto one of your cake recipes! Actually, a lot of your recipes are on my menu- thank you for all you do!